A while back one of my nieces who lives quite far away asked me to join Instagram so we could share photos and keep in touch a bit more (she doesn't do facebook or other social media sites). Sam likes my jewelry shots and Arizona sunset pics and I love the photos she shares of her and her daughter goofing around. It makes us feel like we're 'up' on what's going on in each other's lives. Instagram makes it so easy for me to drool over jewelry shots people post, too. I really enjoy seeing jewelry photos from the designers I follow and look forward to the pics they post of trunk shows, jewelry exhibits, photo shoots and things of this nature as well. Gold and Pearls - Perfect Combo! I recently posted a couple of shots of the jewelry I was wearing and had some of my friends tell me they thought that was a good idea and I should do it on a more regular basis - sort of a 'who's wearing what today' kind of thing. Black and White - Layered and Fun! They thought it would be a good way to let other's see what styles people are actually wearing on a daily basis and possibly what's actually trending where because, as they put it, "it's fun to see what styles people in other parts of the country or world are actually wearing today". My girlfriends are so smart!! Our conversation got me thinking about how when I meet new people and they find out what I do, they often ask me questions or make statements such as, "You create jewelry? What kind of jewelry do you make?" "Do you wear your own jewelry?" "Do you purchase other people's jewelry?" "What brands or styles do you like?" "Where do you get ideas or inspiration for your designs?" "Do jewelry people give each other discounts or trade jewelry?" 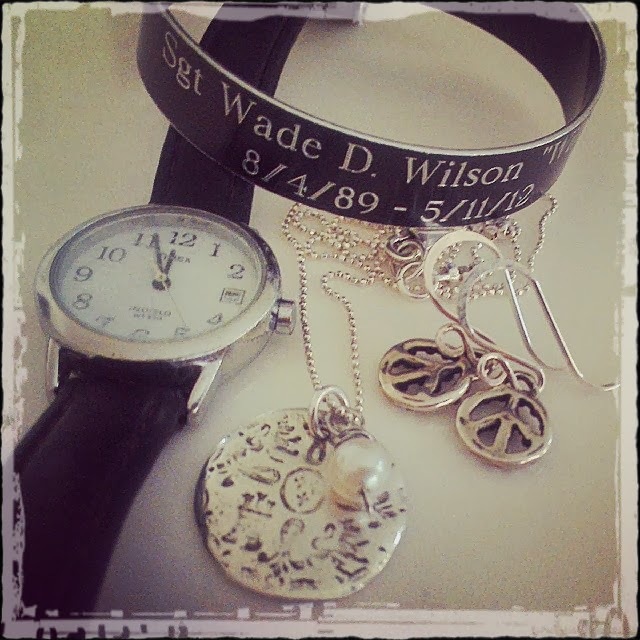 So, how does all this tie in to what my girlfriends were saying and to posting jewelry photos? Well, one year at the Tucson Gem and Mineral show I had an exhibitor (after asking me if I created jewelry) actually say to me, (rather sternly) "You're really not wearing much jewelry. You should always wear 'your own' jewelry. You know, the jewelry you actually create. It would help you sell more." Funny thing, but I actually was wearing jewelry I had created. I had on my large, hammered silver hoop earrings, my silver PMC coin pendant necklace w/salt water pearl dangle and my silver stack-rings and thumb ring. I had on my 'I pretty much wear this every day' jewelry. Most days, this is what you'll find me wearing in the studio. So yes, I do wear my own jewelry but no, I don't go 'over the top' and pile it on just so people notice its presence. Maybe I should, but it's not really my type of marketing, I guess. 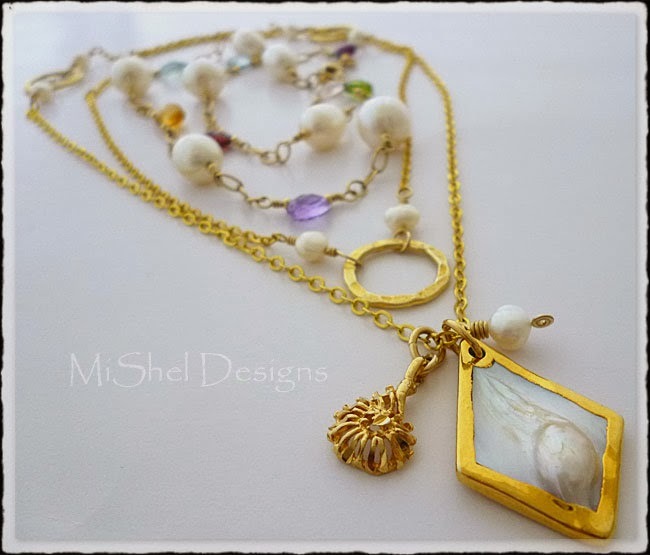 I wear jewelry I create (and sometimes that of other designer's too, mind you!) that fits with my mood, fits what I'm wearing and what I'm doing that day. I wear jewelry that fits me and my lifestyle. I guess I thought everyone did that. Maybe not. None-the-less, I decided to follow the advice of my girlfriends(I can see them smiling every so happily right now!) and do occasional posts of "Jewelry of the Day" in some form or fashion, whether it be jewelry that I have on that day (mine or other brands/designers), or a collection of pieces I've found online that are interesting, cool and fun. It thinks it's a great way to see what's out there and what people are really wearing on a regular basis. Today I've posted the recent shots that led to this post being created. This time around, these are all me. Either what I was actually wearing this past week / weekend or what I was about to put on for the day. 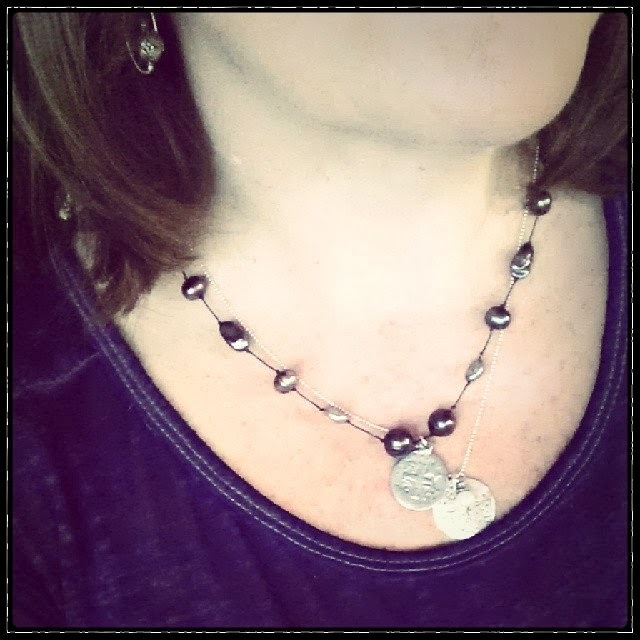 it's that same fine silver coin pendant I made,...my every day necklace! How about you? 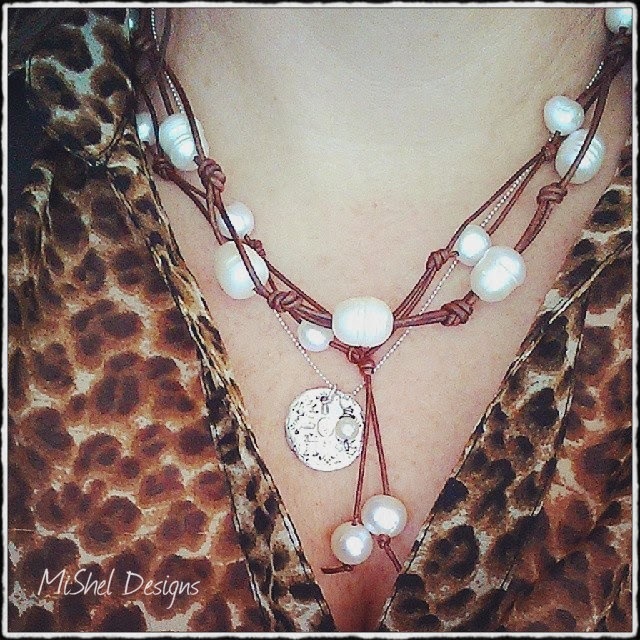 If you create/design jewelry do you wear as many of your best pieces as you can each time you go out to help your jewelry get noticed and sell more (it has been proven to be a good marketing avenue), or do you keep it simple, wearing what fits your mood and wardrobe for the day and then market your designs in other ways? my coin pendant necklace (some habits are hard to break!). Peace, Love and What are you wearing today? 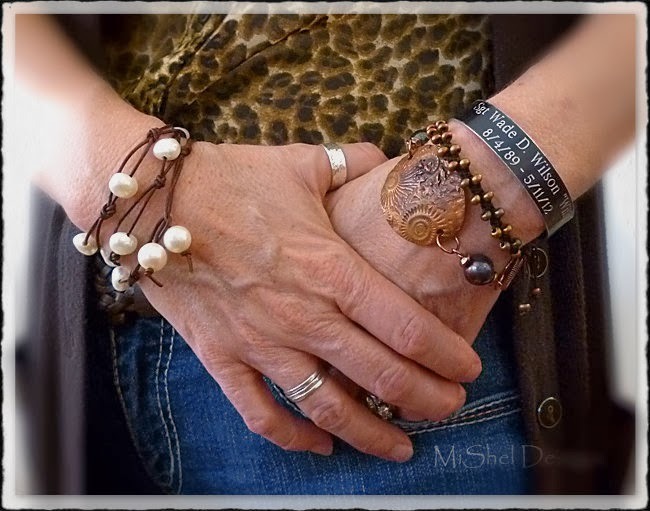 Layers of Bracelets - a "norm" for me. my copper and pearl link bracelet with the coolest of cool copper ammonite focal piece from artist Kristi Bowman! I also use Instagram for posting photos of myself wearing my jewelry. It's a common place to do it, so I say go for it! Yes, it's everywhere that's for sure and it's so fun and interesting to see what people all over the planet are adorning themselves with these days. It took me forever to get on Facebook and Blogger - I know should Instagram and one of these days, I will learn that technological feat! :) Excellent idea! 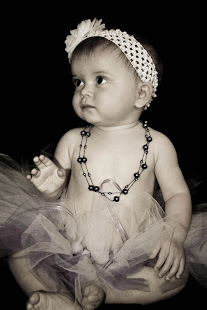 I have seen your pics post on Facebook - gorgeous, as is all of your jewelry! I wear very little jewelry, and what I do wear is definitely in the "simple" category. However, I tend to make much bolder jewelry, which I do wear at shows only! :) I have often thought about why what I create is more elaborate than what I actually wear - I have no explanation!!! I do find it interesting how sometimes we do create jewelry that isn't always in line w/what we're wearing but possibly, like you mentioned, a bit more elaborate. I tend to create what I wear and some things that are a bit more elaborate or bolder than I wear on a daily basis and I think I do it just because it's fun to create and so many people wear much bolder designs than I normally wear. An interesting post Shel. When I am at home I usually don't wear jewelry. My life is industrial at times so the jewelry would get damaged. I do put on jewelry when I am going somewhere. Not so much as a marketing tool just because I am proud of my designs and I like to wear them. I mostly wear my own creations but I do occasionally wear other designers pieces. I make things that I like to wear and I also make things that are way more elaborate than I wear. My sister usually likes those. I often use challenges as my inspiration so those pieces tend to be fancier. 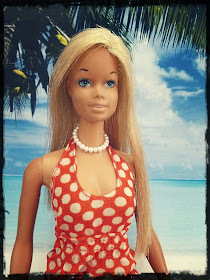 I think we're a lot alike Becky :-) I too make things I like to wear and I also make a few more elaborate or decorative designs and these are usually the ones my sister likes the most and that she looks awesome in, too! I love how you mentioned you wear your jewelry because you're proud of it. I think so many of us feel that way but are afraid to say that and I think that shows grace and confidence o your to say it!! (and the fact Becky that your designs are super pretty is another reason to wear them!) 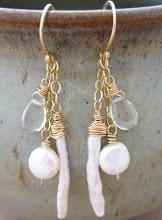 Thanks for sharing - it really is fun to hear what we all do with our own jewelry and why.